Lovely Oona and her lovely cake. The photos don't do either of them justice. This is a fine example of pastry fakery from a lovely young woman who claims to be a costumer/couturier but is just aching to let her inner propster out. Oona Tibbetts created this lovely bundt while overhiring in our shop this summer. I hope you'll all forgive me, my sub-par camera has led to some sub-par photos of this lovely cake. I assure you, the 'real' thing is far more scrumptious looking than these pics give it credit. If any of you many wealthy readers want to see better photos, please send a Canon Rebel EOS to Anna Warren, C/O Milwaukee Repertory Theater, and I'll do what I can. Now, back to Oona's cakery. She decided to make a few adjustments based on size and the flowers we had available in our stock. The cake that Oona made is taller and has a smaller diameter than the source photo, and she used violets instead of pansies. You see, my friends, adaptability! Oona started by carving the cake form from bead foam. After patterning the cake, she set the bandsaw table at a 10 degree angle, and cut the cake with a lovely bevel. From there, she used an Olfa knife to carve away the scalloped pattern around the edge of the cake, and sanded the top to a graceful curve. Once the shaping was done, a coat of Jaxsan (the magic prop goo) was applied to seal the foam and provide a paintable surface. One of our talented props painters (Ilana Kirschbaum, I believe) painted the cake. 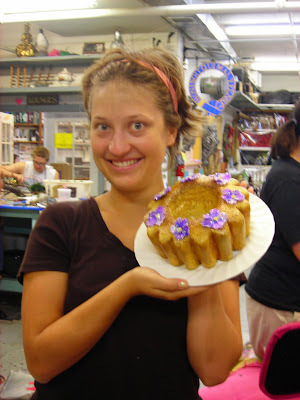 Once dry, Oona glittered up a few silk violets (mmm sugared flowers) and applied them to the top of the bundt. Et, Voila! Another darling addition to the Albert Herring picnic table.